The Japanese custom of moon viewing is held in mid-autumn and is called Tsukimi or O-tsukimi (the honorific term). It is also referred to as the Harvest Moon Festival or Mid-Autumn Festival. It is widely celebrated all across Japan. It is said that the Tsukimi moon viewing custom was first introduced to Japan by China, during the Heian period. Tsukimi takes place on August 15th of the lunar calendar, and it's also referred to as Jugoya, in Japanese, which means the night of the 15th. Jugoya on the solar calendar changes every year but usually falls in September or October. The moon on Jugoya isn't always full, but it is said that the moon on this night is the brightest and the most beautiful of the year. The Japanese celebrate Tsukimi in a rather quiet and solemn manner, although this wasn't always the case. Until the Meiji period (1868 AD), Tsukimi was a time for celebration with parties that ran late into the evening, but this was changed so that this moon festival was a solemn celebration. Although the mid-autumn harvest moon festival is believed to have originated during the Nara period (710 - 794 AD), it wasn't until the the Heian period (794 to 1185 AD) when it gained popularity and aristocrats would cruise the water on boats so that they could admire the moon's beautiful reflection on the water's surface. Other customs involved reading tanka poetry (similar to Japanese haiku) under the moonlight. Other traditional customs include displaying susuki ,(pampas grass) which tends to be at its peak (and its tallest) in the fall, or other autumn flowers decorated in a vase in one's home or near the area where the moon viewing takes place. What Foods Are Enjoyed During Tsukimi? The most traditional food associated with Tsukimi are known as tsukimi dango, or small white dumplings made of rice. However, unlike other rice dumplings which tend to be served skewered and seasoned with a sweet and savory sauce similar to teriyaki, tsukimi dango are plain, and stacked into a beautiful arrangement on a tray. 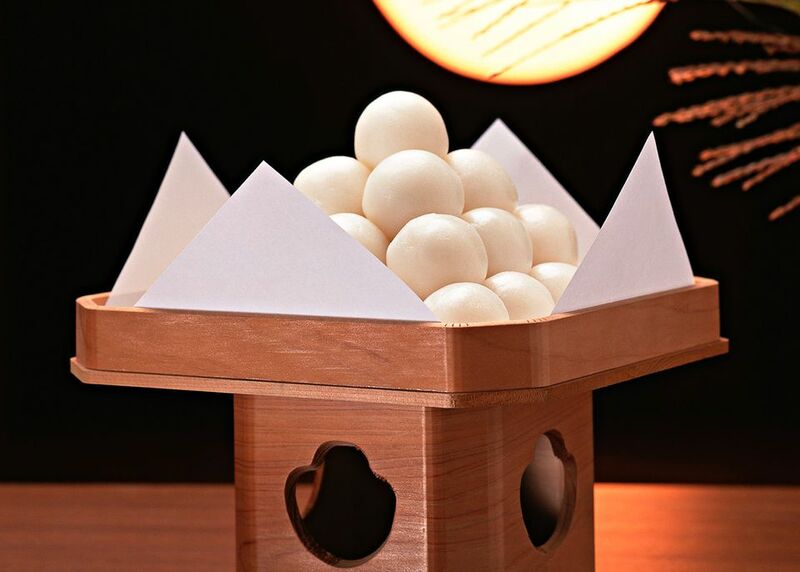 Tsukimi dango are typically displayed in an altar to represent an offering to the moon. Other foods which are associated with Tsukimi include chestnuts, known as "kuri" in Japanese, and taro, known as "sato imo", in Japanese, as well as kabocha (Japanese pumpkin). Here is a bit of trivia regarding the Japanese term "tsukimi": It is also used in Japanese cuisine to refer to specific foods that highlight raw egg or an over easy egg because the cracked egg resembles the full moon. For example, tsukimi soba (thin buckwheat noodles) and tsukimi udon (thick wheat noodles) are traditional Japanese hot noodle dishes in broth, topped with an egg. These dishes are not considered traditional Japanese food for moon viewing or the Harvest Moon Festival.